Sundays — Sat evening: 5 p.m.; Sun: 9 a.m. In the early years, a visiting priest, usually traveling by horseback, celebrated Mass every fifth Sunday in the Mount Washington area. Although as early as 1830 a small group of Catholics tried to organize a parish, it wasn’t until 1845 that land was acquired. The first church was named St. Francis Xavier in 1846. In 1880, St. Francis Xavier was a mission of St. Michael, Fairfield, and in 1911, a mission of St. Aloysius, which had opened in Shepherdsville. By this time Mass was available every week. By the 1960s, the parish had grown to forty-six families with eighty-one adults. The parishioners requested permission to build a church. Groundbreaking took place in 1965, and the new church was dedicated on May 29, 1966. In October of that year, St. Francis Xavier achieved the status of a parish, and Father Henry G. Vessels was the first pastor. 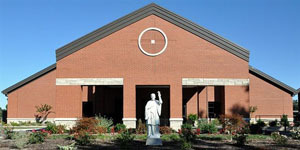 In the 1970s and 1980s, the parish constructed more storage space and an educational center to accommodate the growing parish. In 2010, St. Francis Xavier dedicated their beautiful new 750+ seat church. Built to accommodate the growing Mt. Washington and surrounding areas, it includes a large gathering space area, a drive around drop off entrance, a choir room, two sacristies, a day chapel, adult size baptismal font, and beautiful large stained glass window. Many items from the old church were relocated into the new church in an effort to preserve their heritage, including a large hanging crucifix, the tabernacle, stations of the cross, stained glass window, and various statues. The torch of faith that motivated the early residents to create their own parish continues to burn as the parish has many activities and ministries, as well as a staff in place to assist the pastor.